The U.S. Patent and Trademark Office on Tuesday granted Apple a modified version of a property covering solar panel integration in portable devices, widening the invention's reach to cover electronics with transparent multitouch screens like the iPhone. 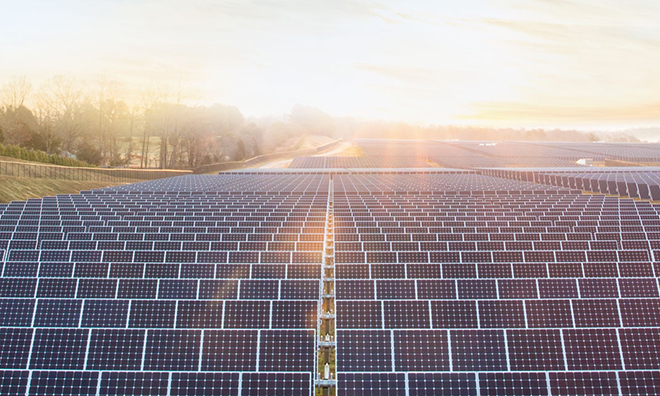 As first reported by AppleInsider last February, Apple's invention for integrating solar panels into touch-sensing components in a portable device were somewhat limited in scope. At the time, the patent was directed mainly at multimedia players like the iPod. With Apple's U.S. Patent No. 8,730,179 for an "Integrated touch sensor and solar assembly," the company offers an alternate take on an hybrid solar system that can be disposed beneath a large touch panel and even flexible displays. Described in the document is a hybrid system in which one or more touch sensor and one or more solar panel layers are integrated into a single stack-up, thus saving space for deployment in tight areas like an iPhone's chassis. The basic design uses a transparent double-sided ITO (DITO) substrate overlaid atop a solar panel cell array, which then translates light energy into electricity that can be stored in the onboard battery. A modification to the original property includes an arrangement in which a flexible single-sided ITO (SITO) substrate can be employed over a similarly flexible polymer solar cell panel. Illustration of flexible LCD and solar array. Unlike the previous version of the invention, the solar panel may be mounted face-down in the stack-up, meaning it would be facing away from the user and back into the device. Due to this change, in some embodiments, the solar panel cannot act in an "optical sensing mode" where the array itself could be used instead of, or in concert with, the capacitive touch layer. When facing away from the touch sensor array, the solar panel must have light piped into the device via light channels. As stated in the patent's claims, the light channel system can be either a parabolic reflector or fiber optics. Parabolic reflector (left) and light channeling methods. In the case of a parabolic reflector or mirror type solution, light collected from around the touchscreen area is bounced onto the solar array. As seen above, the back surface of the touch sensor layer can be made reflective to maximize the amount of light absorbed by the solar panel. Various methods can be employed to allow the passage of light through the front face of the device and into the chassis including light channels disposed around the touchscreen. Alternatively, fiber optics can be used to bend light from the surface back into the device housing and finally on to the rear-facing solar panels. It is unclear if Apple will inevitably use the above technology in a production model iPhone or iPad. With consumers demanding increasingly thin device designs while at the same time asking for power-hungry high-resolution screens, handset makers face a challenge in producing batteries to fit the task. For example, Apple is rumored to be having issues with fitting a suitable power cell into the larger version of its next-generation iPhone. Although a completely solar-power iPhone is unlikely to show up on store shelves anytime soon, the tech would be useful in boosting power reserves and supporting the main battery cell to extend usage time. 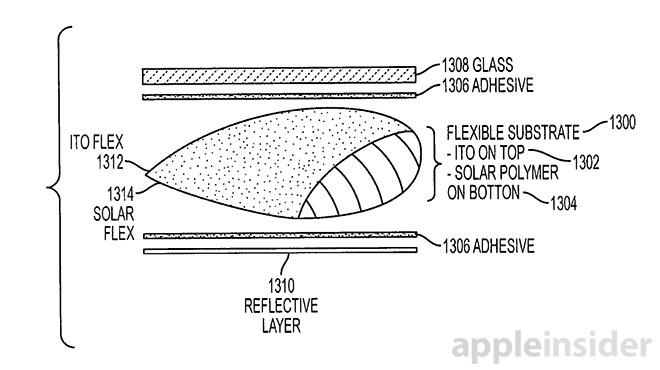 Apple's integrated touchscreen and solar panel patent was first filed for in 2008 and credits Michael Nathaniel Rosenblatt, Benjamin Lyon, John Benjamin Filson, Steve Porter Hotelling, Gordon Cameron and Cameron Frazier as its inventors.